What are the suggested steps for set up on first sign in or before I start using Tralcer? Setting up your profile and preferences is the first step a member should be completing. The first time you login to Tralcer, our Setup assistant will guide you through the entire process. If you opted to set up manually, we recommend following steps. Complete your profile: Your Profile shows your updated information. If you have not completed your profile data through set up assistant, click on the icon. Edit and save your profile information and complete all the fields. Include all your phone numbers and label them correctly. Include all your email addresses and label them correctly. Link and Import your address books: Link all supported emails by clicking icon so that your contacts are imported and address books are synchronized. Tralcer supports Gmail, Hotmail and Yahoo email IDs. You can include non-supported email Ids to your profile so that you can share them with your connections based on your preference. Set your privacy preferences: Privacy sets the privileges you give your connections to see information about you. Your contacts in each group have visibility to your information as per the permissions you set for each group. Select page and select “Privacy” . Select “All” group on the left panel and on the middle panel select the information you want to set as default that everyone can see and “Apply”. You can see the preview on the right panel. Repeat these steps for each group. You may create additional group and set privacy settings for the new groups too.Android & iOS: Access Account Settings from the “Three dot menu” on Top right corner. Remove duplicates: When importing from multiple address books to Tralcer, it is likely that duplicate entries will appear. To resolve this, in page, select “Duplicates” in the left panel and either merge or ignore the duplicates. Merge helps users to be selective on information to retain. Since there are restrictions in merging “Connected” Contacts, it is recommended to remove duplicate entries before connecting. Once connected, it is advised to delete the non-connected duplicate as you get validated information through the connected contact. You can always edit and add additional information to the connected contact. Android & iOS: Access “Duplicates: from the “Filter menu” on Top left corner. “Non Member” – the contact is in your address book but not a member in Tralcer. Non-Member can be invited to join Tralcer by clicking on the bubble or . The system initiates an email from your email client. Tralcer initiates email only if an email client service is configured on the device; not from email web clients. “Not Connected” – the contact is in your address book and a member in Tralcer. You can connect with them by inviting them to connect by clicking on icon. Create new Groups: Groups help you in easily finding the required contact and to set right privacy privileges. Tralcer provides a flexible environment for members to create custom groups. Custom Groups can be created in three ways. On “Settings” > Privacy page, On “Settings” > Group Page and on “Connections” page. We recommend you setting your privacy preference for every group you create. Add contacts to Groups: Select page. Select one or more contacts you want to add to a group. Click to add Contact(s) to one or more groups. What are the suggested steps to set up Vault and Payments modules? On settings page, there are specific tabs for each module and function. 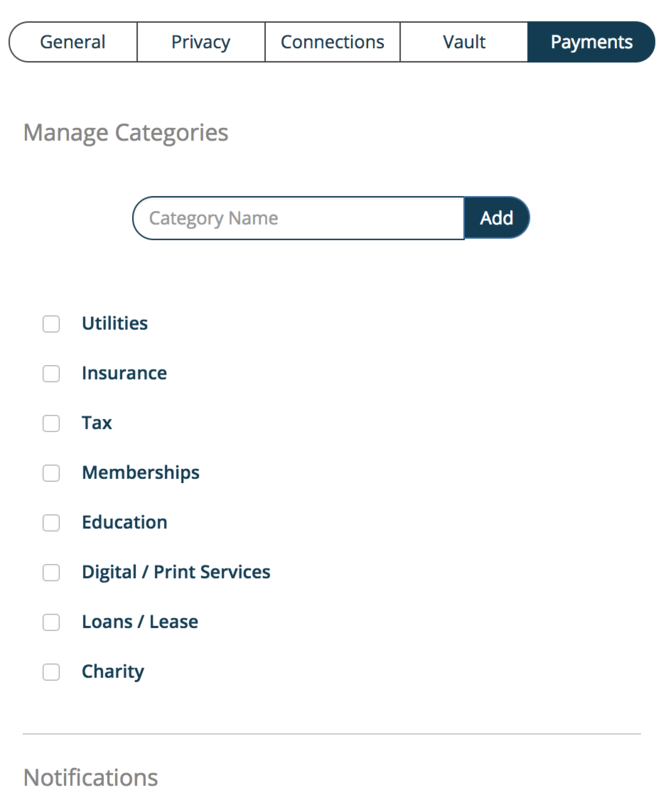 Records in Vault and Subscriptions in Payments are stored with “Category” and “Sub-Category” attributes. A default list is provided. You may want to review this list and add any additional category and sub-category you need to capture your data. Additionally, for Payments, you need to add your default currency and list all Payment Mode information. Payment Mode means, how you pay your bills. This includes Credit Card, debit Card, Bank account, Cash, PayPal, Paytm, etc. Do not enter card numbers or account numbers. You just need to provide a name that you can identify. Expiry date of cards is a valuable information for reporting. Always keep backups of your current address books. It will help you to go back to original state if you wish so. Do not delete Contacts from any linked email address books. Delete in Tralcer and the changes syncs to all address books. Almost all email services offer de-duplication function. We recommend remove your duplicates in Tralcer. Apple iPhone and iPad set up. For optimum experience, we suggest you select your Gmail, Hotmail or Yahoo as default Contact account. Tralcer Synchronizes contacts with contact list of these email services and hence will get updated to iPhone. iCloud continues to be the backup. Steps to do mail and contact set up can be found here: https://support.apple.com/en-us/HT207207. Switch on Contact only for one linked email. All your linked address book has same contacts. Having multiple address books visible will result in duplicate contacts in iPhone. 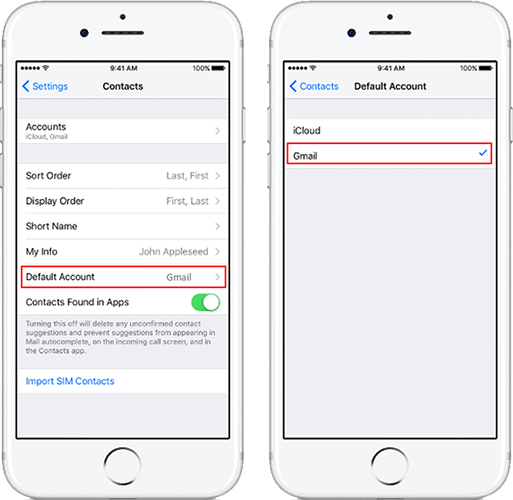 Select Gmail, Hotmail or Yahoo instead of iCloud as the default contact account. What are the benefits of signing up with Facebook, Google or LinkedIn? When you use any of your social media to sign-up or login to Tralcer, you do not need to remember another password. Your social media credentials are used to login into Tralcer. This helps you to seamlessly log into Tralcer automatically on computers where you are already logged into your social media account. What are the benefits of signing up with email? Signing up with email gives you added security as you are using an additional password to sign into Tralcer. Your registered email and password will be required to login; always. What other information does Tralcer access from my social media accounts when I sign up with Facebook, Google or LinkedIn? Tralcer does not collect or extract any information from any of your social media accounts. Tralcer only uses your social media account to authenticate your access. To respect privacy, we DO NOT search social media accounts to report public information about you or your contacts. What is the difference between Individual and Organization sign up? To address the different needs of individuals and organizations in terms of functionality, Tralcer differentiates these accounts. Future enhancements will add more but different functionality for each user type. Therefore, we advise you to sign up for the appropriate type of membership. Can I change my membership from Organization to Individual or Individual to Organization? Since each type of membership has different entitlements and connection history, Tralcer does not allow change of membership types. However, members can cancel their existing membership and sign-up for new membership type. Which are the supported email domains for sign up in Tralcer? Any valid email ID can be used to sign up in Tralcer. Google, Outlook (including Hotmail and live) and Yahoo email IDs are supported for Import of address book and bi-directional synchronization. 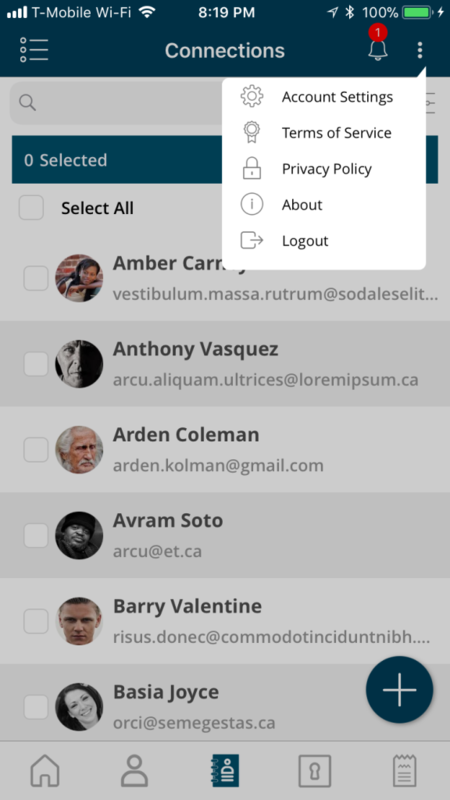 Tralcer accepts non-supported email IDs in user profile to share with their contacts to maintain data accuracy. Change password option is available in Settings tab. Follow the instructions to change your password. Your username will be one of your email addresses. Please try each of your email addresses. If you have added gmail email ID to your profile, you can login using Google. If you have added the login ID for Facebook or LinkedIn, you can login using one of those methods too. To ensure our member privacy and security, we cannot disclose usernames. How do I ensure that my information is updated in my friend’s address books? You have to ensure your profile is completed by entering all your information in Tralcer. Your connections will get your updated information based on privacy preference set by you. How do I ensure that my address book has all updated information? Invite and encourage your contacts to join Tralcer. 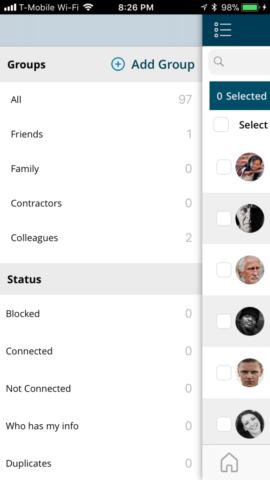 Once they join Tralcer, you are connected with your contacts with dynamic updates happening to your addressbooks. How do I inform and invite my friend to join Tralcer? You can invite your friend from your Tralcer Connections page by clicking on bubble or . This initiates an email which you can send to your friend. Tralcer initiates email only if email service is configured on the device; not from email web clients. How many address books can I link and Sync with? Currently you can link and sync with your Google, Yahoo and Outlook address books. There is no limit to number of accounts you can link and sync. You can add other email addresses to your profile so that you can share them with your contacts. Adding all your address books gives you benefits of controlled privacy and sharing. Is there a limit on number of contacts I can store in Tralcer? No. Currently we have not set any limits on number of contacts you can store on Tralcer. However, while syncing to external email address books, there could be restrictions applied by the emails service providers. At the time of writing this document Gmail has a maximum limit of 25,000 contacts per user it can store (https://support.google.com/a/answer/1146409?hl=en) and iCloud, there by iPhone has a limit of 50,000 contact cards (https://support.apple.com/en-us/HT202158). What is the difference between Linking and syncing an address book? Linking is to read-in the contact details stored in email address books and keep it connected for dynamic updates. This is a one-time process. Syncing is the process of dynamic update of contact list across all linked address books. Any edit, add or delete in Tralcer contact list gets propagated to all linked email address books. Similarly, any edit of add in any of your email address book will propagate to Tralcer and then to other linked address books. What happens if I get an invitation on an email ID which I have not linked to my Tralcer account? Invitation to non-linked email would be an email inviting you to join Tralcer. Login to your Tralcer account and invite the contact from your Tralcer account. Once your contact accepts the invitation, you will be connected. It is ideal to have all your email IDs listed in Tralcer. This will avoid receipt of redundant email invites. What information fields about me are shared by default? By default, Tralcer only shares information fields that you set for the Group “All” in Privacy Settings. Why are edits made to contact details in email address books not reflected in Tralcer instantly? Automatic sync from linked emails is scheduled for once in 24 hours. Hence you do not see instant changes in Tralcer. However, if you want an immediate update of a change made in email address book, you can initiate manual sync by clicking on the “Sync” button in Profile page, Connections page or Settings page. On the other hand, edits made in Tralcer reflect almost instantaneous into the linked email address books. 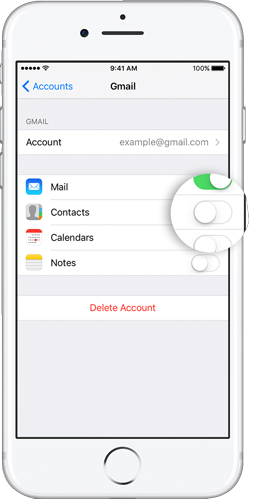 Why does deleting a contact in email address book not sync with Tralcer? This is by design to prevent the disastrous impact syncing of an accidental deletion of all contacts from one linked email address books. You will have to delete the relevant contacts in the Tralcer address book if the delete is intentional. Any contact deleted in Tralcer is deleted from all linked email address books. What is the use of vCard? vCard helps you in sharing your personal information with any contact in your address book. This is required only till they join Tralcer. Once they join Tralcer, you can get connected. What is the purpose of Groups? Groups helps to organize your contacts and is the back bone for setting your privacy. Groups also facilitate effective management of contacts and gives you one click access to initiate an email to all members of a group. Is all information in my profile shared with my connections? No. You have complete control over your information. Visibility to the data is controlled through Contact groups. You can decide what information is seen by which contact group. Privacy settings are applied at the “Settings” page. Can I control who sees what about me? Yes. Tralcer provides you micro-level privacy settings. E.g. : You can share your home address with a friend, still hide from a vendor. Both are your contacts, still have different levels of access to your information which is set be you. Can I rename, delete, merge and reorder groups? Yes; Except “All”, “Organizations” and “Ungrouped”; because these three are system groups. Can a contact belong to multiple groups? Yes. You can add a contact into multiple groups. You can have a contact added to “Colleagues” and “Friends”. Which privacy setting applies if a contact is in multiple groups? Combination of all. E.g. : If a contact is in “Colleagues”, he sees your work email. If he is in “Friends”, he sees your personal email. If he is in both groups, he will see both work and personal emails. Do groups Sync with my email address book like Gmail, Hotmail, Yahoo, etc.? No. Different mail servers handle groups differently. Hence, we are unable to write or sync group information with these address books. How many physical addresses can I save in my profile information? Currently, two – one for home and one for work. What is the difference between “Not Connected” and “Who has my info” status? “Not Connected” means that the contact is a member of Tralcer and you have his/her information in your address book. Contacts in “Who has my info” are Tralcer members who have at least one of your email id’s in their address book, but you do not have their email id in your address book. How do I unlink an email from Tralcer account? If you want unlink any of your emails, simply delete them from your profile. If an email is added and verified and not linked, it can still be shared with your contacts. Synchronization will happen only with linked emails. Do I have to use all 3 modules? Can I choose to use only records or Subscription? You cannot change your user name. Your registered email ID is your username. If you have verified more email addresses in your profile, you can use any of those emails as user name. If you used a password option, password remains same. If any of your email is your social media profile, you can use social media sign in option to access your account. Why am I unable to delete the email id that I signed up with? Your account ID is linked to the sign-up email. Hence it cannot be deleted. Close account option is in Settings page, General tab. All your data is purged and it cannot be recovered. All data includes all information in your profile, your complete contact list, any records you have stored in Vault, all subscription list, all your payment modes. In short, there will not be any trace left. This does not affect address book in any of your linked emails. Can I add non-supported email domains to my profile? Yes. We recommend you adding all your emails ids. This helps you to share your contact details with all your connections based on privacy settings. You will not be able to link, import or synchronize contacts with non-supported emails. How can I import contacts from non-supported email IDs to Tralcer? Export contacts from non-supported email ID and import them to a Gmail, Hotmail, Outlook or Yahoo ID which is inked to Tralcer. As secure as possible. We take your privacy and security very seriously. Hence, we will never share your information or data with anyone, not even personally unidentifiable data. Neither will we permit in-app advertising. We do it to minimize the potential for hacking and to protect your data and privacy. Our business model is based on our loyal user base. However, there is hardly any system that is not hackable today. So, while we back up your data regularly, it is critical for users to maintain personal backups of their important information. I currently use Google drive and other cloud storage to store all my documents, why should I switch to Tralcer Vault? Tralcer Vault is not just a static repository of files and folders in the cloud. It is an intelligent repository. It stores documents as records with intelligent meta tags. There are three key differences. A record can have multiple files in it. An example could be property document which has PDF and JPG files. Tralcer Vault takes it all in one record and assign information (meta tag) relevant to that record. This makes it easier to locate the record. Tralcer Vault can remind you to renew your driver’s license and passport and any other record which has renewal date well before it expires. Tralcer Vault helps you to securely share sensitive personal record by dropping the record directly into the vault of your connection. There is no Link sharing or email sent. You can also set a time validity and the record will be removed from their vault on the set date. What is the price of the module? Tralcer Vault is an integrated module of Tralcer. There is no separate pricing for the module. How do I upload my documents on Tralcer Vault? On Web, drag & drop to the “Add Record” window or browse and add from folders. Multiple files can be added to one record. On Android and iOS, browse and add from device or use device camera. What is the maximum size limit for documents uploaded? One record can contain multiple files. Tralcer supports up to 25MB per record. What details do I need to enter while uploading the documents? Name of the record, renewal date if applicable and type of record are the information entered while adding a record to Vault. The details added are the properties of the record that helps user in easy retrieval and timely reminder of renewal if applicable. How do I sign up for Tralcer Vault? There is no separate sign up or Login required for Tralcer Vault. Tralcer is an integrated product and single sign on gives access to all modules. How do I share my documents on Tralcer? Select the record to share and click on the share icon to share. Records can be shared within Tralcer with other Tralcer members, where no file or link transfer happens over the internet. Share record appear in receiving person’s Vault. Records can also be shared with people outside Tralcer thorough a 7 days valid URL. How does Tralcer vault track renewal of my personal documents? When a renewable record is added to Tralcer Vault, user adds renewal date. Tralcer Vault uses this date for reminders. What kind of information is stored in the documents? Physical files and information provided by the user. I have all my personal documents on Google Drive. How do I transfer to Vault? Use “Add new Record” to add documents from Google drive to Tralcer Vault. Google drive and other online storage stores documents as individual files. Tralcer stores them as records; means multiple files (documents) can be in one record. This is particularly helpful when each page of a multi-page record is stored as multiple files (documents) and when one record has multiple file formats. Can it track membership renewal of associations? Yes. Like any other renewal reminders user will be reminded based on reminder settings. Can you import documents directly from Google Drive & any other document retrieval system? No. Google drive and other online storage stores documents as individual files. Tralcer stores them as records; means multiple files (documents) can be in one record. This is particularly helpful when each page of a multi-page record is stored as multiple files (documents) and when one record has multiple file formats. What does Tralcer Payments do? Does it handle all my payment transactions? Tralcer Payments is one of the modules of Tralcer. It gives you a consolidated view and analysis of your recurring and non-recurring payments. It helps to understand cash flow on a monthly and annual basis. It also reminds you of payment due dates. Tralcer Payment does not handle any payment transactions. It reminds you to make payments on time. Why do I need to disclose confidential information like my bank account numbers or my credit/debit card details? If not, why do the Payment mode fields that ask for these details? You do not disclose any sensitive information. In fact, we recommend you do not enter your card numbers or account numbers. You only need to enter a name which you can identify. E.g. : ABC bank VISA, XYZ Checking account, PayPal, Cash, etc. I understand frequencies like monthly, quarterly and annual, but what is specific schedule? This is to capture payments which are non-recurring. E.g. : There could be a deposit which needs to be paid in two installments on two specific dates. I have some bi-weekly payments, is it possible to enter these? How? Add them as 2 payments with Monthly frequency. E.g. : Payment 1 on 1st of the month and Payment 2 on 16th of the month; both with annual payment cycle. Currently Tralcer support one currency. This is to facilitate more accurate analysis. You need to convert any other currency to default currency. The payment analysis is very useful. Can I export these reports to Excel? Can I share these reports with my family group in Connections? Can I generate custom reports? Payment analysis reports are generated from multiple components of data. It contains data on past payment made and future payments. It cannot be exported or shared. You can however take screenshots of analysis, store them in your Tralcer vault and securely share with your connections. Currently Tralcer do not have custom reports. We would like to hear from you if you are missing any reports. What does Manual Payment mean? Is it only for payment modes like cash or check? Any payment which is not set for auto payment is a manual payment. This applies to all payment modes. I had deleted some Payment modes. But they still seem to appear in my reports. Any payment mode used for any past payment will continue to appear in reports. Can I select which email id I should get payment alerts on? Currently email alerts will be send to the primary email used to sign up in Tralcer. Can I sort payments by value instead of an alphabetical sort? Tralcer supports only alphabetic support. What is last payment date? If I have a last payment dated 24th Dec 2017, does it mean that the payment will be deleted from my list of active payments (and reports) in 2018? Last payment date is applicable to term based payment. E.g. : a car lease has a term and there is a last payment date. Payment will never be deleted and it contributes to analysis. Amount of that payment will not appear in your further payment commitments and analysis. I understand Price change due to trial/promo period ending. How do I enter the pricing after the trial ends? Do I have to create a new payment entry? If so will my old trial entry become inactive after the price change date? When there is a price change, edit the current entry with new amount and next effective due date. Enter new price change date if applicable. If not applicable, delete the date. Your amount you paid in the past does not change; only future amount changes. Can I filter my view by “Active payments”? or can I sort active/inactive payments? Current filter allows you to view upcoming payments in the next 30 days. Currently there is no filter for active / inactive payments. I terminated a subscription service in July. Hence, I deleted the Payment. Will it still figure in my reports for the first 6 months? How do I add new payment sub-categories? Sub-category in Tralcer Payments is called “Payment Type”. You can add new category and Payment Type on Payments tab on settings page. 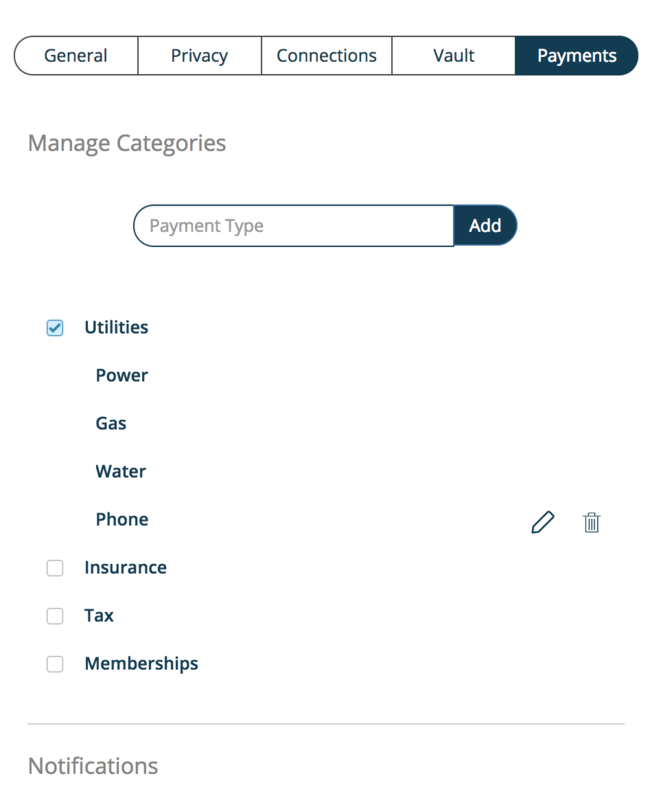 To add a new Payment Type, select the desired Category, and add. New category ca be added when no selection is active. 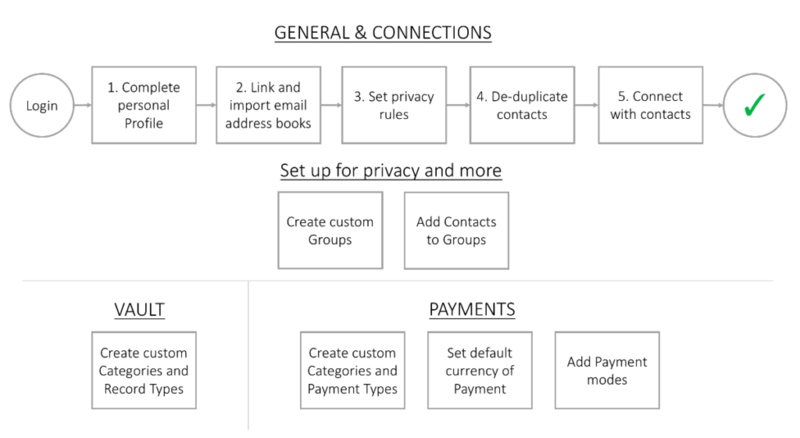 Image below shows how to add Category and Payment Type. Does Tralcer share my or my contacts’ details to others? As a policy, we do not share your information or data with anyone, not even personally unidentifiable data. Neither do we permit in app advertising. What kind of communication can I expect from Tralcer? Can I search and find contact details of other Tralcer members? Tralcer do not allow search of its member database. This is to respect personal privacy of members. You can search for connected or non-connected contacts in your own address book. I do not want one of my contact to see any updates on my profile. Can I block selected users? You can block selected contact in your contact list so that they do not get any more updates from you. You do not get any update from blocked connection as well. How does a blocked contact see my data in their contact list? They will have the information as per the last update before you blocked them. After being blocked, your name will appear as “Not Connected” in their list. Will my contacts know if I have blocked them? No. We do not show block status to your contacts. However once blocked your name will appear as “not connected” in your blocked connection’s list. Whenever you remove the block status, contact will return to the connected status. Will Tralcer keep sending invitations to my contacts? No. Tralcer will not send any invitation to anyone. User invites their contacts. To avoid spamming, we made this intelligent. A Tralcer member will never get an invitation email from anyone on any of the email IDs verified in his/her Tralcer profile. Tralcer member always get invitation to connect, which is an in-app notification. As secure as possible. We take your privacy and security very seriously. Hence, we will never share your information or data with anyone, not even personally unidentifiable data. Neither will we permit in-app advertising. We do it to minimize the potential for hacking and to protect your data and privacy. Our business model is based on our loyal user base. However, there is hardly any system that is not hackable today. So, while we back up your data regularly, it is critical for users to maintain personal backups of their important information. Refer to our Security Practices page to learn more. Tralcer is a Personal Information cloud (PIC) that automates the management of personal data. Using Tralcer, individuals can effortlessly keep their address books updated, synced and accurate. Individuals can store, index and catalogue important personal documents, get reminded to renew documents on time and easily access these documents anywhere, anytime. Individuals can also track, manage and get detailed reports of recurring personal or household expenses, get reminded when payments are due or payment modes change. All the above is done in a completely secure and private environment with selective sharing based on the user’s choice. Similarly, organizations can use Tralcer to keep their contact databases updated automatically with the latest, accurate and user verified information. This will eliminate the need to constantly update their database manually. This will also eliminate bounced or returned mail and provide tremendous cost savings in communication. Organizations can also use the Tralcer to post and share membership documents and payment receipts with connected members within Tralcer’s secure and private environment. Tralcer can be used by individuals and organizations. The app permits users to sign up either as an individual or an organization. Based on the type of user the app automatically configures its menus and workflow to suit the needs of individuals or organizations. I am already using multiple email address books for my contacts. Why do I need Tralcer Connections? While every email application provides an address book feature, these are static address books. The information in these address books remain unchanged unless one edits it. Moreover, one has no means to verify if the information in these address books is current and accurate. Tralcer connections uses a different workflow. Each contact card in your address book is owned and managed by the original owner. Therefore, as long as the original owner makes the necessary changes to the information as they happen, their information in your address book gets dynamically updated. 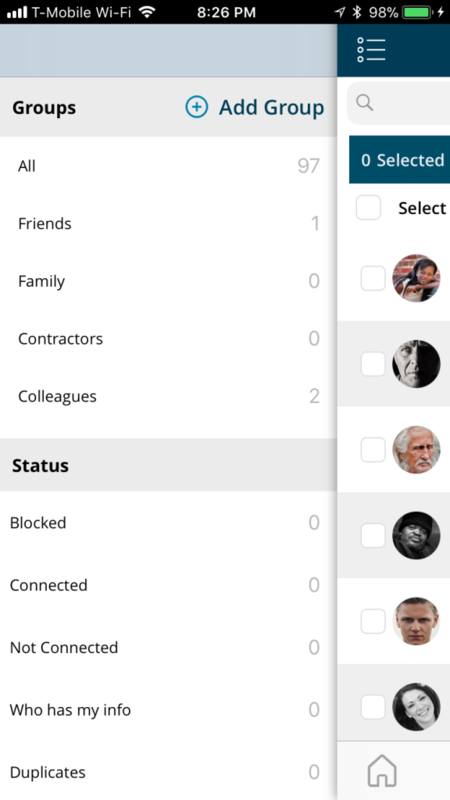 Therefore, each user of Tralcer connections only need to update their own profile and not worry about editing or updating others contact information. I am already using local and cloud storage for my documents. Why do I need Tralcer Vault? Tralcer Vault is not just a static repository. It is an intelligent repository. It understands the type of document stored. As an example, if one were to store one’s driver’s license in Tralcer Vault, the system understand that the stored item is a driver’s license and therefore it will have a serial number, an issue date and an expiry date among other information. Tralcer Vault stores such information as a meta tag to the document. Now this document is searchable and indexable. Tralcer Vault can even remind you to renew your driver’s license well before it expires. You can store an offline copy on your mobile device or even securely share the document with anyone, for a specified period of time. I have payment reminders set on my calendar. Why do I need Tralcer Payments? Tralcer Payments does a lot more than payment reminders. It provides configurable summary and spend reports. It also understands the payment modes attached to each payment. So, if anything changes it alerts you. As an example, if you terminate one of your credit cards, it is very difficult to remember which payments were attached to this card. With Tralcer Payments, the system understands such changes and identifies potential issues and alerts users to make the necessary changes. How easy is it to migrate to Tralcer? Tralcer is designed to provide a very easy migration. The system can directly read information from commonly used address books like Google, Microsoft and Yahoo. It can also read address book information from your smartphones that use Android or iOS. Therefore, the process of migration easy, quick and does not involve re-entry of existing information. How much does Tralcer cost? The Tralcer app is a free trial (on web, Android and iOS) until Mar 31, 2018. Thereafter these will be a very affordable annual subscription fee if US$4.99/per year for individuals and US$14.99/ per year for organizations.